A measurement technology originally developed for mining, quarrying and construction applications by Actronic Technologies is helping Australian livestock producers realise greater profits from lot feeding in addition to making savings when doing regular supplementary feeding. According to Loadrite Product Manager, Elliot Chisholm, the Loadrite onboard weighing system for loaders has delivered significant benefits for farmers around the world. By installing the system on the tractor’s front end loader for accurate bucket-by-bucket measurement, the machine operator can see exactly the quantity of material in each bucket and how much has been moved in total, making it ideal on farms where feed needs to be measured out for livestock. Farmers, for instance do not have to wait until the entire load has been moved to a weigh station when they need to load a certain amount of feed. The Loadrite onboard weighing system also ensures the farmer does not have to take any excess feed back to the pile because the right amount can be loaded from the start. The system is particularly useful for farmers handling different kinds of feeds. Elliot explains that the Loadrite system’s active tip-off function enables fast and precise last bucket adjustment to ensure the target weight is achieved. The system is able to cope with variables such as slopes or changing conditions. 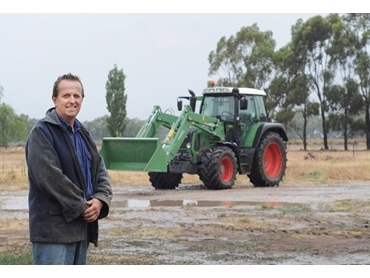 Russell Foote has a 150-hectare dairy farm in northern Victoria, milking 335 cows. He recently implemented the Loadrite L2180 scales on his tractor’s front end loader after hearing about the system from a friend in New Zealand. He observes that the ability to measure the feed consistently is a big advantage of the Loadrite system. During supplementary feeding, it is important to ensure cows receive the right amount of feed in terms of both quality and quantity consistently to promote optimum levels of milk production. The Loadrite onboard weighing system was installed in one day. He has also been receiving excellent service from the Victorian Loadrite distributor, Galesafe. With Australian producers constantly under pressure from rising input costs, Elliot predicts the system will become more popular as local livestock and dairy producers and lot feeders realise the extent of the productivity and cost benefits. Depending on the scale of the operation, it can save producers thousands of dollars each year in feed costs while also increasing operational efficiency. Mike Davey, a dairy farmer operating on a total of 176 hectares on New Zealand’s North Island decided to try the Loadrite onboard weighing system after reading about it in a local farming magazine. He explains that it is important to feed the cows the right amount for maximum milk productivity and quality. Since supplementary feed can be expensive, it’s important to give them just the right amount. Mike points out that overfeeding will cost more without any benefit, while underfeeding results in leftover feed that may spoil and be wasted. The Loadrite system is in use on two of Mike’s tractors with an indicator showing the operator when the correct weight has been reached. Accuracy in measuring out the feed is a major advantage since they no longer have to guess the weights in the buckets. Mike has observed a definite increase in productivity since installing the Loadrite scales. In addition to getting more done in less time with fewer turnarounds, they can now be certain that the cows are getting the right amounts of feed, mixed correctly. The system also allows them to keep accurate records. The Loadrite load weighing technology and payload information systems are installed on wheel loaders, excavators, garbage trucks, conveyor belts and other equipment to ensure optimal loads and provide quality data for productivity analysis.